The Titleist Pro V range is the #1 Ball on the Worldwide Tours, and these Titleist Pro V1 and Pro V1x Lake Balls offer additional bonus of low spin from the longer clubs and a higher ball trajectory, all for the fraction of the price of new balls. These fantastic balls featurea new, patented thermoset urethane elastomer cover that delivers more short game spin and control, and softer feel. The softer, reformulated cover system improves feel, sound and short game scoring control, providing golfers the confidence and performance to hit it closer to the hole. See how the new cover formulation will help your short game performance. The Pro V1x is long for golfers of all skill levels; long with drivers, long with irons, long on all shots. How can long and straight benefit you? It provides supreme distance on all shots for golfers of all skill levels and for you. 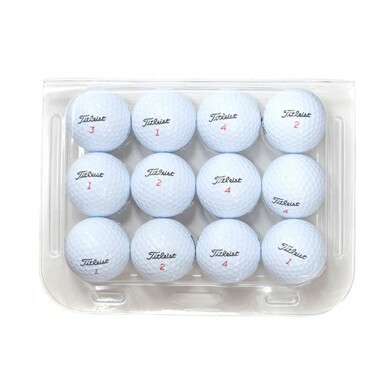 Your game is sure to improve by simply switching to these golf balls. With their greater distance, fantastic spin and superb soft feel and control, the Titleist Pro V1 range of golf balls are sure to reduce your scores and your handicap. Titleist Pro V1's are as good as new for a fraction of the price, saving you a massive £32!! !